Sure it is hot, but you just have to leave early, right? That is when you can catch the most fish and the best light anyway! 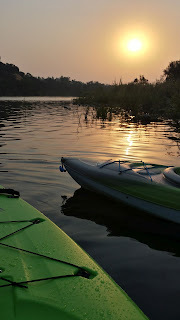 Dianne and I hit the American River again this year. This section of the river is not real scenic, but it is fast clear water and it is walking distance away. We car-topped our two kayaks on foam blocks and and used one of our bikes and a short Uber ride to self shuttle. We got a bargain on both boats. Both were on sale for the holiday and came in well below $300 hundred each. Here in California we are not required to tag them but there are darn few put-in that won't make you pay for both parking and boat launching. As they say: "It's the land of milk and honey, but you better have good money." I had been putting off replacing our boats, but all that flooding in TX and Louisiana got me nervous. The lime green boat is a Revel 10 kayak made by Emotion Kayaks and Dianne picked a Pelican Tracker Angler kayak. Both boats performed well on the short trip from Sunrise Recreation Area down to the take-out at Rossmore Bar. Got a plan a longer trip next time though. This one only took about an hour. We spent more time setting the shuttle up than paddling the river today!